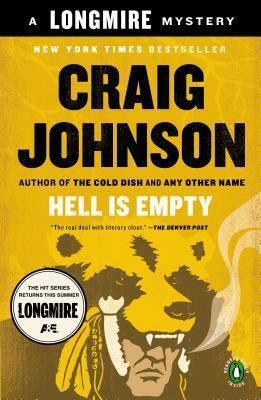 Hell is Empty (Longmire Mysteries #7) by Craig Johnson is available at Amazon, Barnes and Noble, and BooksAMillion. Fans of Ace Atkins, Nevada Barr and Robert B. Parker will love this seventh novel from Craig Johnson. Well-read and world-weary, Sheriff Walt Longmire has been maintaining order in Wyoming's Absaroka County for more than thirty years, but in this riveting seventh outing, he is pushed to his limits. Raynaud Shade, an adopted Crow Indian rumored to be one of the country's most dangerous sociopaths, has just confessed to murdering a boy ten years ago and burying him deep within the Bighorn Mountains. Walt is asked to transport Shade through a blizzard to the site, but what begins as a typical criminal transport turns personal when the veteran lawman learns that he knows the dead boy's family. Guided only by Indian mysticism and a battered paperback of Dante's Inferno, Walt braves the icy hell of the Cloud Peak Wilderness Area, cheating death to ensure that justice—both civil and spiritual—is served. I complained about the previous two books in this series. I was worried this one would disappoint too but Johnson's back on track - I read this book in two sittings. I've mentioned in previous reviews that the show is true to the books in the same way that Midsomer Murders was true to Caroline Graham's books: the show captures the essence of the characters but takes liberties with plots, which keeps both formats fresh for viewers. I've also noted that the deviations between the show and the series grow with each book. This is one of the books that was turned into an episode. Up until this episode, the show only hints at Walt's spiritual nature so this episode was one that tried to touch base with the series. I appreciate that, I really do, but the show doesn't depict the depth of Walt's spiritual side as shown in the books. I don't know that the show can, it can't give us the inner workings of Walt's mind without changing format; we'd lose something of the supporting characters and they are big part of the books too. So it's one of those things that the show mediates. Shrug. I take that with a grain of salt. Some people will be annoyed by the deviation. The books make me think better of Walt on the television. One of the strong draws of this book series is the romantic plot threads - I love how Johnson draws out these relationships over several books; there's no drowning in pages of characters staring into each other's eyes. When they talk to each other, it's real conversation, not endless dialogue promising sweet-nothings. I prefer romances written by men and targeted at men; they feel more real to me than bodice-ripper romances. This series, taken as a whole, is a superb example of how romances should be done.